How to Automatically Sync Contacts Outlook with Gmail Account? Outlook and Gmail have separate address books. They don’t sync, which means that if you change your contacts in one or the other, then you have one address book that remains unchanged. Here’s how to keep your address books synced with free, open-source software. Outlook and Gmail have separate address books. They don’t sync, which means that if you change your contacts in one or the other, then you have one address book that remains unchanged. Here’s how to keep your address books synced with free, open-source software(How To Sync Outlook Contacts With Gmail). You see the problem? It’s not one without a solution however, with GO Contact Sync Mod, you can keep your Outlook and Gmail contacts in check. If you make a change to one then you can use GO Contact Sync Mod to update the other, quickly, conveniently, and almost effortlessly. GO Contact Sync Mod doesn’t try any funny stuff. It’s open source, so it’s free to use, and doesn’t have toolbars or spyware spoiling the experience. Before you can install GO Contact Sync Mod, you need to download and install the Microsoft .NET Framework 3.5. Then you can install GO Contact Sync Mod and start keeping your Gmail and Outlook contacts in perfect harmony. When you first open GO Contact Sync Mod, you’ll need to enter you Google account username and password before you can sync anything. Remember, if you’ve got two-factor authentication enabled on your Gmail account, you will have to use an app-specific password. 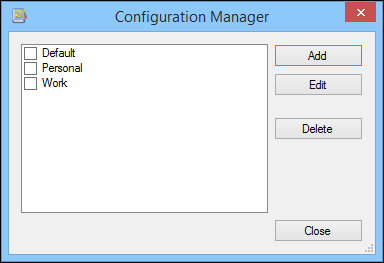 This will open the configuration manager. The options here are very simple. If you’ve already entered your login information, click “add” to create a new profile using that username/password combination. The “edit” button merely lets you rename your profile. Looking at the sync options, you can select, which Outlook contacts to sync, choose whether to sync deleted contacts, and whether the program prompts you when deleting contacts from your destination address book. Note, in addition to contacts, you can also sync your notes and appointments. If you have “prompt deletion” selected, you will be asked how you want to proceed. 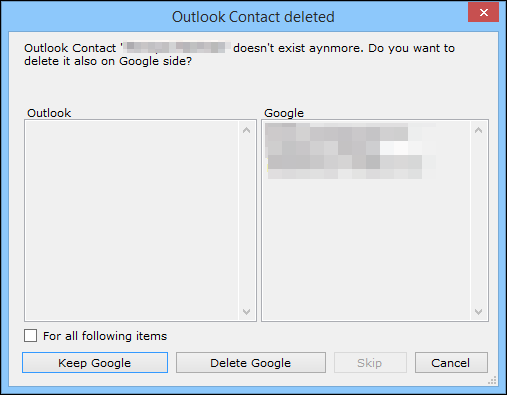 For example, in this screenshot, an Outlook contact has been previously deleted. GO Contact Sync Mod prompts us whether we want to keep the Google contact or delete it too. Below the sync options between outlook and gmail are some important configuration settings. Though these options have check boxes beside each, you can only choose one. By default, the program will prompt you if you want to merge any duplicate contacts, or you can decide whether Outlook wins or Google wins the merge operation. Finally, you can select which way syncs are performed – either Outlook to Google or Google to Outlook. The automation settings let you choose whether program runs at startup, and if it automatically syncs. If you choose the auto sync option, the sync interval can then be set. It’s set to sync every two hours by default. If you select “report sync result in system tray,” a report will pop up from the GO Contact Sync Mod system tray icon. You may have also noticed the sync details and log. With this, if there are any errors reported, you can see what they are and make the necessary fixes. Finally, right-click on the system tray icon to execute a manual sync, show, hide, or exit the program. Unfortunately, it only works with Gmail, so if you use another e-mail service or applicatoin, then the manual method might be your only recourse. That said, GO Contact Sync Mod will save Gmail users a lot of time and effort when it comes to maintaining and syncing contacts between it and Outlook.